HERALDIC ARTIST S.H.A. 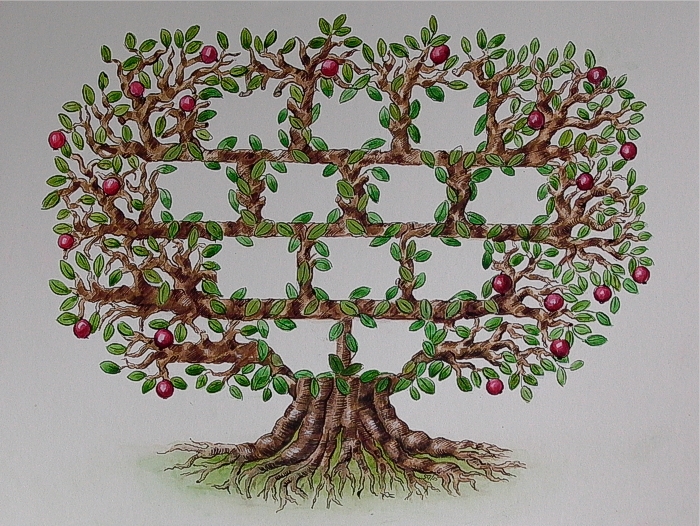 - Coat of Arms & Family Tree Designs | Susi Galloway – Heraldic Artist S.H.A. HERALDIC ARTIST S.H.A. 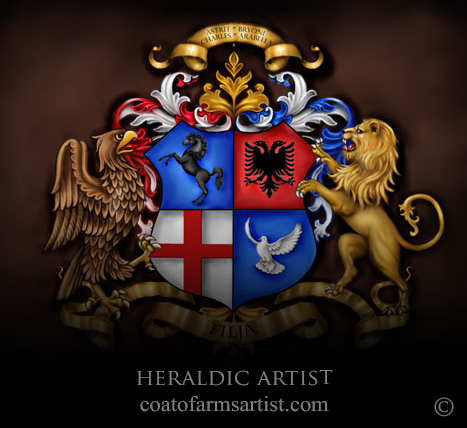 – Coat of Arms & Family Tree Designs – Susi Galloway – Heraldic Artist S.H.A. You must have arrived here, because you are searching for a coat of arms, or because you need help with designing one. I can help. 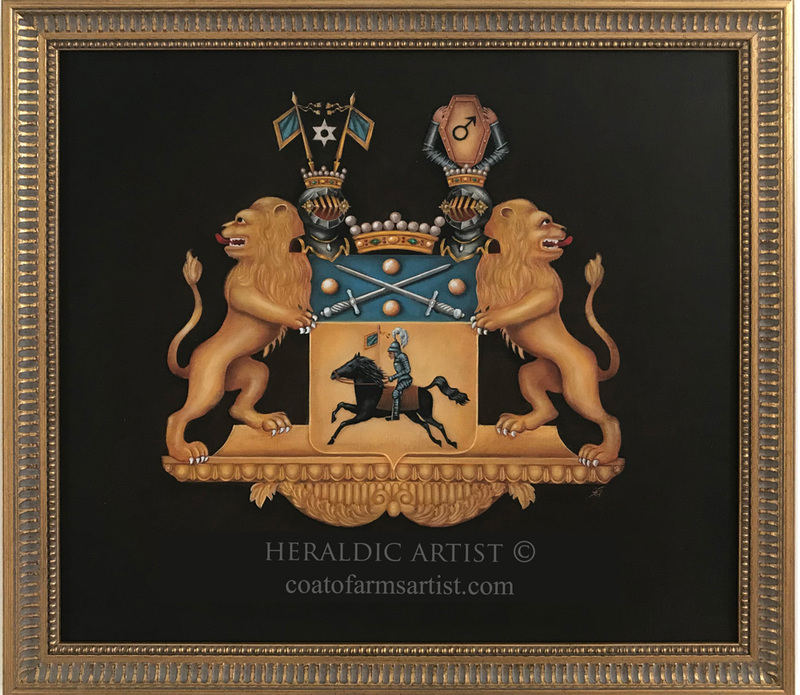 With many years of professional experience I have designed and painted Coat of Arms, Family Crests, Family Trees and Monograms for many individuals, families businesses, nobility and royalty around the world. I can transform your ideas into a coat of arms and provide a variety of subjects, genres, media and artistic styles. I work both in traditional and digital media. Feel free to check out the samples above, they lead to my different portfolios, or click on the portfolio links in the top menu above the slide show. For more info or a FREE Consultation click the link in the top menu or the red tab on the right. THANK YOU! I thought you might appreciate seeing how the poster turned out. And it’s indeed quite spectacular. Hello Susi!! 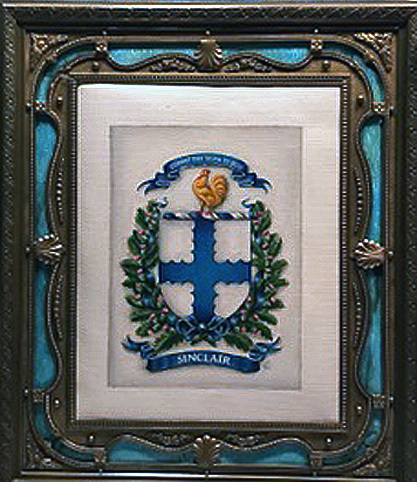 We finally had our beautifully painted Crest framed in an antique bronze and enameled frame from France. My husband is thrilled and we love it!! Working with you was an amazing and wonderful experience. Your design and the quality of your art surpassed our greatest expectations. Thank you so very much for such a joyful experience planning this surprise 70th year gift for my husband. Our family will treasure your pairing for a lifetime! Best wishes to you always! I found Susi’s website purely by chance – after searching the net for months! Last year she helped me design my family coat of arms, which has received nothing but compliments! So much so, I decided to get a monogram designed by her a few months later. Both designs are exquisite, and exactly as I wanted them! Thank you so very much Susi for your talent and patience, in working with me last year and this year (for the 2 new designs), you’re the best! Susi, I would like to thank you for the AMAZING design of our new family crest. It is exactly what I had visualized, if not better. I would like to thank you for the painting. Attached is a picture of your painting with the new frame. I think it looks fantastic! Appreciation: Susi, we had the 75th birthday party over the weekend and presented the digital Coat of Arms. Your participation both in the research for and presentation of the finished product was invaluable. For six months we searched but were unsuccessful and then by chance found your website. Now, not only the recipient but also those in attendance repeatedly commented on the impact of what they saw. “Thank You” seems so inadequate but it is from the heart. Great, thanks! You’re the best and I have a couple of friends you’re interested in doing the same thing I will definitely send them your way. Just wanted to let you know that our family crest has been framed and delivered and it looks great! We hung it last night and it fits perfectly. It was a long process but definitely worth it. You did a wonderful job and I appreciate it. It looks beautiful. Dear Susi, You are on the other side of the United States but with our first contact I felt as if you were across town and that you are a friend I didn’t know I had. Being the person you are as a professional artist with so much patience you made the gift of my husbands Coat of Arms painting more meaningful and sentimental than anything ever could have! You helped me make decisions that I wasn’t sure to make and made the whole experience such a pleasure! Needless to say, My husband and our two son’s love the painting! It’s amazing and beautiful. Thank you so much! I just received the painting. It looks spectacular. Thank you so much. Beautiful work. I will send you a photo of it mounted in my office after I get it framed. Susi: Your painting was a complete success! My father love it! It was so interesting to see all the grand children approached the painting and try to find themselves on the Family Tree, and the excitement on their faces when they located their name’s. I sent you some pictures of the painting at the party (a little under 200 people attended), and the painting hanging in my father’s new home. Thank you for making such a wonderful work of art, and if I am down in Florida. I will stop by and thank you personally. Susi, Your are the greatest! 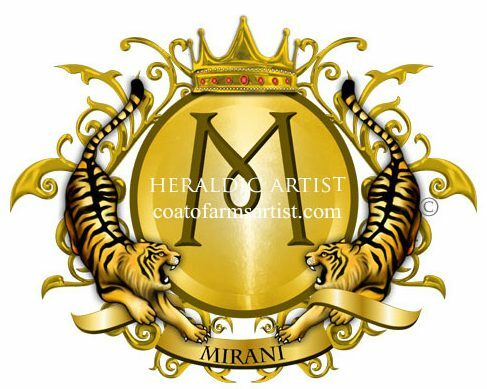 My corporate logo will be legendary, thanks to your artistic gift and talent. I’m convinced that every entrepreneur should utilize your services…..in fact it should be law! Thanks, for your patience and professionalism! My goal in the near future is to have a full-size painting done to hang in my office……so you will be hearing from me again soon! God bless you and your household…… always and forever! We are immensely impressed with Susi’s work converting two heraldic arms into digitized renderings that now have practical utilizations in the modern world. Susi’s attention to detail and ability to let her own creativity shine through work that otherwise calls for accuracy and detail is very impressive. Susi’s artwork contributes to the history and preservation of heraldic art by helping to ensure the continued and increased use of arms and crests in the electronic age. After 35 years, our Foundation decided to update its heraldic crest. While not a true coat of arms, I fell in love with Susi’s work on the web and knew that she would be the only person to accomplish it in the fashion we wanted. She not only intuitively understood the task, turned the project around in record time. She not only preserved and improved all of the pre-existing heraldic elements, but added decorative pieces that have turn it into a truly impressive work of art. I know the new crest will inspire more doctors to participate in Foundation activities. I would recommend Susi Galloway to anyone wishing to add a touch of professionalism and art to their organization’s public face. If you’re looking for a computer generated “coat of arms” specialist, look no further. Even though I live in “Microsoft Land” in the Northwest, which is a stronghold of international computer talent, I was curious to see who was really the best in the country. Who would have thought the winner was clear at the other end of the country? If you want the absolute best in quality and service at the most reasonable price, Susi is your solution. By the way, second place was way back. The art work that you provided of my Scottish coat-of-arms, both the black and white line drawings and the full color drawings of the crest, clansman badge, armigers badge and the full achievement of the arms were exactly what I wanted, and met all my expectations. It was wonderful to do business with you and I look forward to our next project. Susi Galloway took our family history and symbols and transformed them into a new art form through the beauty of her brush for us to cherish forever. Thank you, Susi. If you’re looking for quality work and prefer to work with a conscientious artist that is customer oriented… look no further. Susi produces beautiful work and will do what ever it takes to get the job done to satisfaction. Thanks again Susi! Dear Mrs. Galloway, the Coat of Arms is excellent. Thank you for your fast and well done work. Interested in a Coat of Arms or a Family Tree? Request a Free Consultation.